Eyes on the Price: What’s Next for FX Transactions Cost Analysis? Volatile currency prices, the imminent arrival of a new European regulatory directive and a series of market-rigging scandals are adding to the urgency for global top-tier institutions to show they are getting best-quality execution on foreign exchange trades. Bolstered by the imperative to cut costs and boost returns, more institutional investors, large corporations, banks and other financial services firms are subjecting more of their FX trades to Transaction Cost Analysis (TCA). 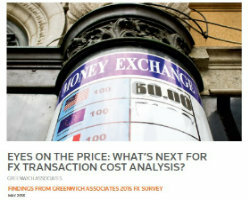 Find out the results of the Greenwich Associates 2015 FX Survey and what’s next for FX TCA in the new whitepaper from Thomson Reuters and Greenwich Associates. To read more, please download the full whitepaper from the link on the right.